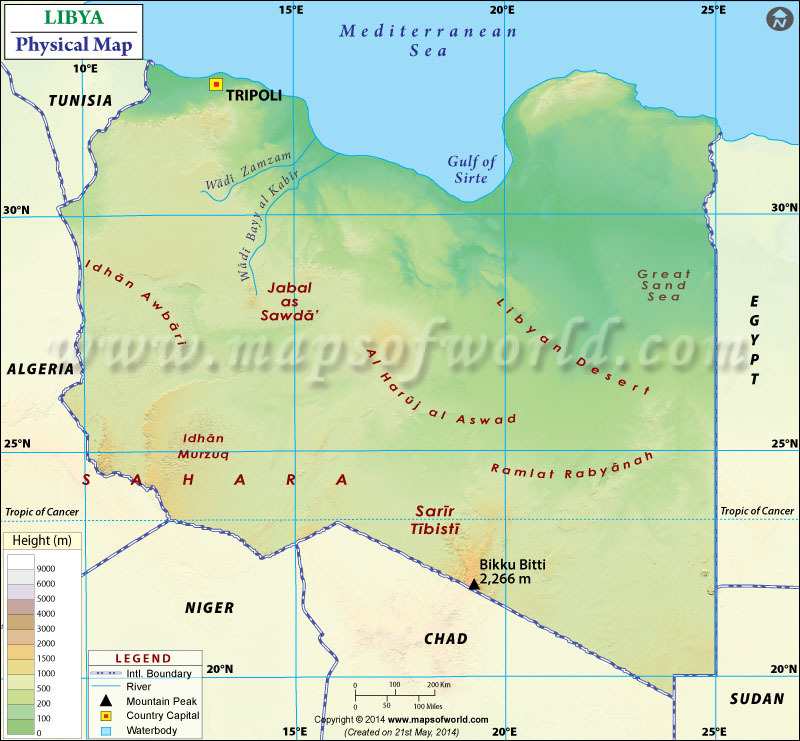 Libya is an African nation situated in North Africa, along the Mediterranean Sea. Libya shares borders with Egypt, Sudan, Chad, Niger, Algeria, and Tunisia. The capital and largest city in Libya is Tripoli. The flag of Libya, first introduced in 1951, saw a return in 2011 after the Gaddafi regime was overthrown. Early known inhabitants of the region of Libya are said to be that of the Berber people of Afro-Asiatic origins. They settled in the region sometime in 8000 BC, followed by the Phoenicians who established trading centers in the western part of Libya. The next settlers were the ancient Greek colonists who occupied eastern Libya. Before Islam and the Arabs arrived in the region in 642, it had been ruled by several empires such as the Persians and Egyptians. . It was also ruled by the Roman Empire from 146 BC to early 600 AD, which made the region one of the earliest centers of Christianity at the time. Muslim Arabs started to invade in 642, converting the region to Islam. The Arabs ruled Libya until the 16th century. The Spanish empire briefly invaded in the 1510 and followed by the Ottoman rule that began in 1551 and ended in 1911 with the Italian occupation. From 1912 to 1927, the region was called Italian North Africa, and from 1927 to 1934, it was split into 2 colonies: Italian Cyrenaica and Italian Tripolitania. In 1934, the region was given the name Libya. During the 2nd World War, Italy joined forces with Germany and eventually lost the war. In 1947, a peace treaty was signed with Italy and the Allies, which forced Italy to give up all their rights over Libya. On December 24, 1951, King Idris I became independent Libya's first king. However, the country's first and only king's reign was short lived. In 1969, Muammar Gaddafi staged a military coup against the king and was later declared as the new ruler of Libya. Gaddafi led the nation to progress and improved the standard of living in Libya but also brought with it brutality and oppression. In 2011, after 42 years in power, instability and political violence led to Gaddafi's end and the liberation of Libya from his rule. Libya is found in the Maghreb region of North Africa. It is bordered by the Mediterranean to the north, Algeria & Tunisia to the west, Niger and Chad to the south, Egypt to the east, and Sudan to the south east. Libya is the 4th largest nation in Africa, and the 17th in the world. Its 1770 km coastline is also the longest of any African nation on the Mediterranean. The climate is dry, with more than 90% of its total land area covered in desert. Theoretically speaking, Libya has a parliament government that is represented by the Council of Deputies that meet in Tobruk. The members of the Council were appointed into office through the June 2014 elections. However, their power is extremely limited due to the conflicts against Islamist militias that control the capital of Tripoli. The Libyan tourism industry has been heavily hit by the warfare that has occurred over the last several years. Some of the historical sites have been neglected but many of them are still very well-preserved. For tourists, Libya is known for ancient Greek and Roman ruins, as well as the Sahara desert. Leptis Magna is the biggest tourist attraction in Libya. It used to be the most prominent Roman city in the region. It is located at Al Khums, 130 km from Tripoli. The unspoiled Roman ruins are spectacular, being one of the best examples in the Mediterranean. Cyrene is an ancient Greek settlement that was established in 630 BC. It is today an archaeological site, famous for its Temple of Zeus structure. Red Castle Museum is located in Tripoli, and it houses over 5000 years of Libyan history artifacts- from the precolonial times to the independence revolution in 1953. The Tadrart Acacus is famous for the petroglyphs in its caves, which are protected by the UNESCO. Rock paintings of animals and humans riding on horses and doing daily activities show that settlers existed in the area some 12,000 years ago. Education is free and compulsory in Libya for children ages 6 to 18. Adult literacy rate is at 89.2%, with 25% of the population holding university degrees. The University of Libya in Benghazi was the first university built in the country. Recent trends show rapid increases in the number of students in higher education is matched with the higher number of institutions in the country. Libya ranks at 10th place with having the biggest oil reserves in the world. The country's official name is the State of Libya. During Gaddafi's reign, the Libyan flag was a solid-green color - which was the only one in the world. Alcoholic consumption is illegal in Libya.